I’ve been looking forward to playing Skylar and Plux: Adventure on Clover Island ever since I first set eyes on the teaser trailer. Judge me if you will, but there are times when you have to put the big budget shooters, racers and open worlders to one side, replacing them with a classic 3D platformer. When that platformer comes with a couple of delightful characters, a good few areas to explore and plenty of collectibles to pick up, I think the change in pace it brings is warranted. But for all my hopes and dreams, and with its best intentions quite obvious, Skylar and Plux falls short of ever delivering a worthwhile experience. Right Nice Games and Grip Digital feel that there is a place on modern day consoles for a vibrant 3D platforming world, one which pays homage to the classics of our youth and does away with the grim realities of the numerous survival titles out there. 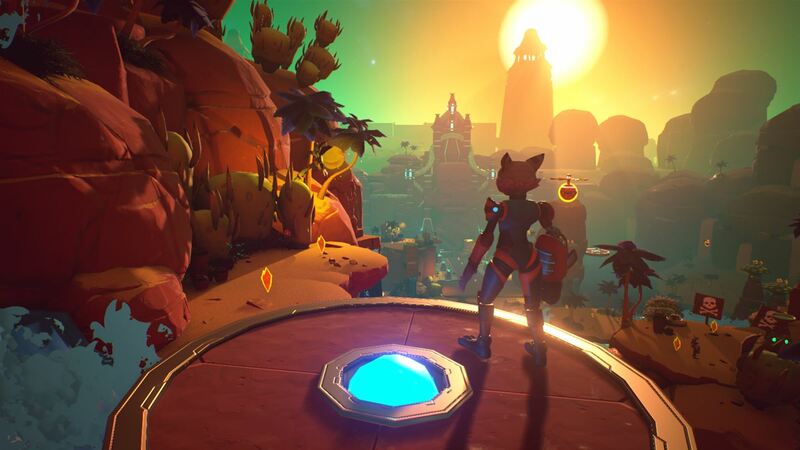 For what it’s worth, I tend to agree with them, but even though Skylar and Plux: Adventure on Clover Island is that wonderfully vibrant, super bright world, it never ever reaches its potential. The story behind it all is that our main hero, the feline Skylar, is joined by his trusty wisecracking sidekick owl, Plux, as they attempt to save their newfound home from the evil CRT. If they fail, then well, the land and its inhabitants, the Lo’a, will be nothing but a distant memory. After being given a talking to by the Elder of the world, you head off on an adventure across tropical beaches, through volcanic caverns, over snowy mountaintops and beyond the vast expanses of the desert, all as you free the Lo’a from CRT’s cages, and hunt down three fuse cores which will stop the evil ‘mastermind’ in his tracks. It’s simple 3D platforming stuff, with plenty of jump and double jump action to be found throughout. There are also a number of clever gadgets that Skylar can utilise, with power jumps, magnetic gloves and a bit of slow-mo time freezing magic all available. 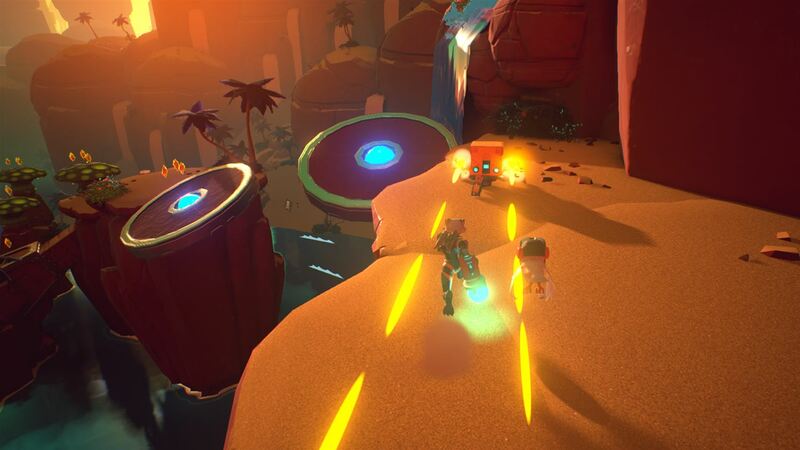 You’ll also have access to a jet pack which lets you power your way from platform to platform, dodging a few strange minions, gatling guns and turret bots as you go. These special powers are well fed in to the story of Clover Island, and you’ll most definitely need to use them in order to succeed, combining all the powers at your disposal at certain points throughout. But it doesn’t take long to realise that Skylar & Plux has issues. Pretty major ones at that. Numerous glitches are in place, allowing you to reach parts of the world that should really never be reached. At one point I was left to jump and climb a hilltop when suddenly I found myself high above a waterfall, able to walk above the entire world. Until a point where all visual hell broke loose and I was left to plummet to my death. There are other moments when I was able to walk Skylar into, and through, solid rock, whilst magically transporting from one side of an iron gate to the other was pretty much the icing on the visual glitching cake. The graphics themselves are fairly standard fare never wowing at any point, but I would happily have let Grip and Right Nice get away with things should that have been the case throughout. But again, constant visual stuttering, during game time, cut scenes and even the damn credit roll, really shouldn’t be in place in this day and age. Checkpoint placement is also more than annoying, and even though you think a point in the game has saved, a quick death caused by the jagger of screen sometimes sees you needing to retrace your steps more than you really should. Unless of course Skylar & Plux takes pity on you and decides that you really don’t need to head back too far. At one point in my playthrough, I found myself falling to my death and re-emerging at a checkpoint. Coming up to the same bit, I died again (yep, like I said, don’t judge me). You would therefore expect to be taken to the same starting point again? Well, normal game rules usually apply that logic but not in my adventure in Clover Island, instead seeing me restart from a totally different point in time. What is that all about? I have no idea. When you think that the loading screens themselves are lengthy, the visuals are frequent stutter-fests and the odd checkpoint seems to occasionally be missed, then you’ll see how my initial love for Skylar & Plux quickly waned. The skipping of previously viewed cutscenes is also a cumbersome affair with the need to head into a main menu each time you wish to ignore previously watched video, whilst the ping of an achievement unlocking, whilst glorious in itself, completely ruins the atmosphere when it appears before you’ve actually finalised your objective. Great way of spoiling things there guys. I’m also not particularly sure who Skylar & Plux: Adventure on Clover Island is aimed at. My initial thoughts are that any casual platforming fan would adore it, but the mechanics aren’t up to scratch for that to be the case. The bright visuals and delightful duo may therefore appeal to kids, but the strange story, although rather infantile, is a bit deep and cluttered for the younger generation to really appreciate. That leaves achievement hunters to run through what is in place, gathering cheap easy gamerscore across the couple of hours of story you’ll find. But even then the constant problems will put just as many off. So it must be said, Skylar & Plux: Adventure on Clover Island is more than a disappointment. 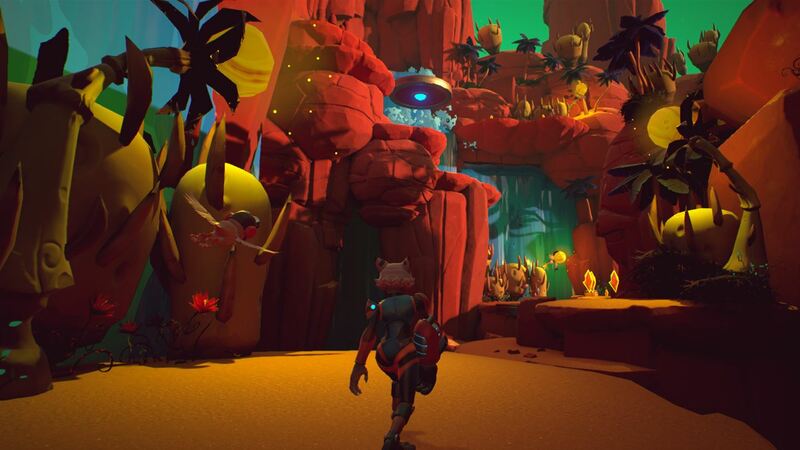 The main heroes are likeable enough guys – although I’m still not really sure of the point of Plux – and the world you get to journey through is a decent one with plenty of collectible opportunities. The problem is, there are too many glitches, stutters, pauses and loading screens for the duo to ever become really loved. And that’s a massive shame.